NETWORK FINALS: SUNDAY NIGHT FOOTBALL adjusted to 6.4, down 0.06 from last week’s final. Football also affected FOX, where 9-1-1 adjusted up 0.3 to 2.6, and both reruns of FAMILY GUY and REL lost 0.1. On CBS, BIG BROTHER gained 0.1, and both 60 MINUTES and the NCIS: LA rerun dropped the same. CABLE HIGHLIGHTS: AMC’s FEAR THE WALKING DEAD had a 0.12 bump to 0.69, with TALKING DEAD up 0.04 to 0.26. On Showtime, SHAMELESS was steady at 0.39, KIDDING rose 0.04 to 0.11, and THE CIRCUS ticked onto the chart at 0.07. 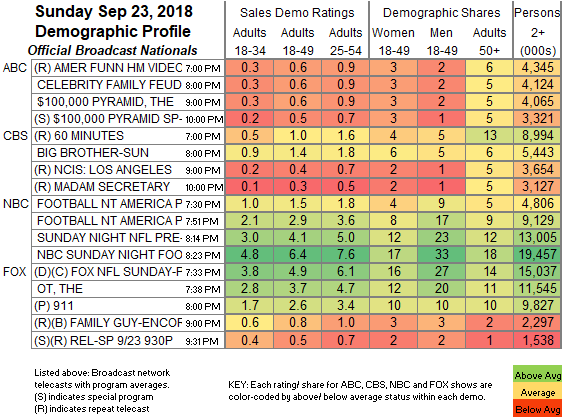 On HBO, LAST WEEK TONIGHT returned from a week off at 0.33, BALLERS shed 0.03 to 0.29, INSECURE dropped 0.05 to 0.21, and THE DEUCE was down 0.02 to 0.13. Adult Swim’s VENTURE BROTHERS lost 0.03 to 0.29. NOTE: for some reason, TNT’s entire slate was listed as reruns, but THE LAST SHIP was up 0.03 to 0.28/1.4M. Hallmark’s CHESAPEAKE SHORES climbed 0.04 to 0.23. Lifetime’s YOU slipped 0.02 to 0.21, with the lead-in original movie CONRAD & MICHELLE WICK at 0.20. On Starz, WARRIORS OF LIBERTY was steady at 0.03.82K, and AMERICA TO ME was also steady at 0.02/46K. Sunday cable overall was led by TLC’s 90 DAY FIANCE, up 0.11 to 0.82, with UNEXPECTED up 0.02 to 0.39. On E!, KEEPING UP WITH THE KARDASHIANS jumped a tenth to 0.48, and ASHLEE & EVAN was also up a tenth to 0.23. Discovery’s ALASKAN BUSH PEOPLE gained 0.06 to 0.44. Bravo’s MARRIED TO MEDICINE rose 0.07 to 0.38. HGTV’s line-up was led by CARIBBEAN LIFE at 0.35/0.31, compared to last week’s 0.30/0.28. 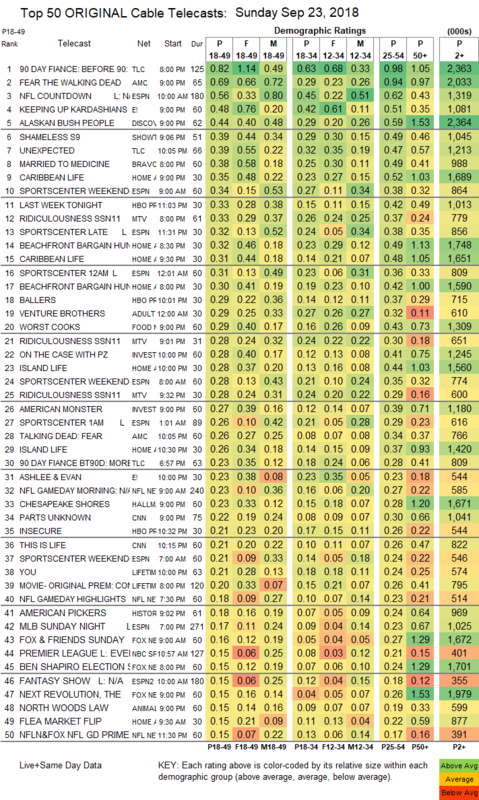 MTV’s RIDICULOUSNESS was at 0.33/0.28, compared to 0.30/0.28/0.25/0.22. Food Network’s WORST COOKS IN AMERICA dipped 0.02 to 0.29. ID’s ON THE CASE was up 0.02 to 0.28, and AMERICAN MONSTER returned at 0.27. History’s AMERICAN PICKERS was at 0.19.